By the fall of 1944 the Western Allies appeared to be having it all their own way. The summer's Normandy invasion had finally succeeded and the Germans had been driven out of northern France and most of the Low Countries. By the fall of 1944 the Western Allies appeared to be having it all their own way. The summer’s Normandy invasion had finally succeeded and the Germans had been driven out of northern France and most of the Low Countries. In September the invasion of France’s southern coast had met less opposition and Allied divisions had begun lining up along the Rhine. But while the Americans were about to meet a nasty surprise in the Ardennes, the Germans never did let go of the province of Alsace, and in a hard pocket around the city of Colmar continued to resist. On New Year’s Eve they launched a counteroffensive, Operation Northwind, that nearly put Allied forces back on their heels. While the Allies were eventually able to take care of their Ardennes problem the Colmar one still remained. On January 12, 1945, Eisenhower could only tell George Marshall, “It is a very bad thorn in our side today." This is the story of the Sixth Army Group (7th US & 1st French Armies) which fought on the southern flank of the SHAEF front. The French had multiple problems during this campaign so that increasing number of US divisions needed to take part. In the process the 3rd and 28th Infantry Divisions, and 10th and 14th Armored, among others were able to cover themselves with heroism, though hardly less than the threadbare German 19th Army, which bravely resisted against enormous odds until finally the west bank of the Rhine was cleared. Amidst a horrific winter and rough terrain, interspersed by demolished towns, both sides traded blows in a ferocious campaign often neglected in histories of the war. This book informs us fully of the tremendous and costly struggle waged on that often-neglected sector of the front. 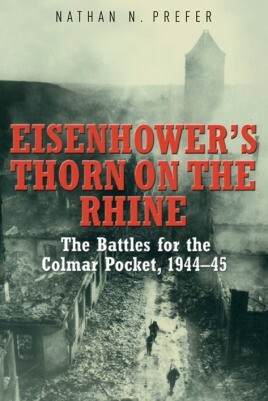 Nathan N. Prefer has a reputation for re-examining World War II battles that history, for whatever reason, has overlooked, and in Eisenhower's Thorn On The Rhine, he's uncovered a humdinger.